Yes, as every year Christmas is here again, and a slightly bit different setup for us once again. I did Wreath for us this year, from last years leftover Christmas decorations, and put it on the door. Lets hope this year nobody nicks it like last year. And at least we made the tree look snowy. Nobody saw any snow around here on Christmas day for a few years. I remember sometimes when I was small girl, having white Christmas‘s. Since this is Catholic region, Christmas is celebrated on 24th in the evening. Father Christmas comes in the afternoon/evening on the 24th. We only had an English Christmas on the 25th until Angel understood what’s going on, but now she’s five years old, she sees it all around her on the 24th. So now, in the morning we do the Christmas socks. We go to Church at midday of 24th - it’s not really a Mass, it’s more like service for children. It’s not very long, and the kids like it. It does have very nice atmosphere and it occupies the Children while Father Christmas is doing his main job. After Church we are having a late lunch or early diner. We are sticking with turkey this year as usual. The traditional dinner here is fish soup, fried fish and potatoes salad. It would not be that bad, except the fish is a Carp. Normally people don’t eat it all year, and you can only buy it in special shops, but before Christmas the fish stands appear everywhere in front of supermarkets and on main squares. We do not like to eat it, but we like to go look at them. All afternoon and evening we are unwrapping gifts and playing with them, watching fairy tales on TV, since there is really nothing else much to watch on any Czech channel. Christmas TV here is all oriented around the children. On 25th in the morning we going to visit those few relatives we do have here, and have a second Christmas. Everybody‘s happy. We decided to give Daddy little time off on his own last weekend. With Angel we visited local Gallery to see some Bethlehems. They are all handmade and privately owned. The owners are lending them to the Gallery only for two weeks at Christmas time, for everybody to see. I like to share a few of them with you. There are so many of them. No one is prettier then the other, but each one is unique in its own way, and usually very old. Pattern notes: Squares are worked in sort of “circular crochet method”, begin to crochet around the ring and in 2nd row forming up the square. Don’t turn, but continue in same direction. Round 2 : Ch 1, sc in next st, sc in next st, sk next 2 sts, (2 dc, ch 3, 2 dc) in next st, sk next 2 sts, sc in next 2 sts, * sc in next 2 sts, sk next 2 sts, (2 dc, ch 3, 2 dc) in next st, sk next 2 sts, sc in next 2 sts *, repeat from * to * around, join with a slst to beg sc. Weave in ends. I crocheted the first row of squares together in two corners as I went. Afterwards I secured them on the top with sc’s. I did three rows of scs. You may need more or less rows, depending on type of your project. After I just kept adding the squares as you can see on pictures. curtain and put them on. So now I just pressed it on the Velcro from inside. It holds on perfectly. So there it is. I’m pleased (really I’m very easy to please) with the result. The colours are very happy. It’s covering all it needs to cover and still lets some air in and out. It’s a nice hideout for Angel and the main thing is - the colours are her choice. In moderation this pattern can be used for all sorts of projects. And here’s something little from my Grandmas attic. I found this pattern interesting. Thank you all very much for visiting my new blog this year. Myself, and my family, would like to wish you all a very Marry Christmas with as little stress as possible. And from all of us, a Happy New Year. I truly believe that all our sensible wishes can come true in 2015. Today I picked up a few cute thing, that may came handy around Christmas. In this country is quite common to take the shoes of when entering anybodies house. So I found these beautiful slippers. At Christmas time, when people are visiting or people are being visited more often, these slippers can come handy. You can carry them with you everywhere and you’ll be more than in. I‘m not against bought decorations, but I still like to make some of my own. I found these and I think Mary and Joseph fit into our setup nicely. And there was something missing in our kitchen and this one was the cutest one. Every year the nursery organizes little show, where kids are singing carols around Christmas tree. It’s followed by indoor markets, where the kids are selling things they made. Usually decorations, gingerbread etc. Parents, grandparents or other family members also take part by donating their own hand made Christmas bits. It’s all sold and put towards some extra special gift for the children. This year will be truly special, since the nursery got flooded not so long ago due to some plumbing problems. Nearly everything is replaced by now, but we all trying to help as much as we can. We are slowly cleaning my grandmas attic after she passed away, and I found loads of old magazines. It was very hard to read it, and I had to redraw it. This heart chart gave me reason to make the shelf look nicer. I even made some lace for a friend. The size may vary slightly depending on type and/or thickness of thread you using. Ch 27, dc into 4th ch from the hook and continue according to the chart. Repeat as many times as needed, until you reach the length required. This all made me pretty busy last couple of days. The progress on my curtain for Angels room is slow, but I’m really dedicated to finish it before Christmas. One of the rather popular ones is celebration of St. Nicholas (little Christmas preview as I call it), which is not just Czech speciality. In the Christian calendar, the feast of St. Nicholas falls on December 6. His cult gradually spread throughout Europe (Austria, Bavaria, Hungary, Netherlands, Belgium, Russia, parts of France, Slovak) and the world. Today St. Nicholas is the patron saint of several countries, territories and towns, plus a number of professions and trades, mainly students, sailors, merchants, pharmacists, solicitors and lawyers. In most countries, Nicholas comes to homes already on the eve of his feast, to check how the kids behaved in the last year. A lot of children can look forward to smaller toys, sweets and fruits, the naughty ones get the potatoes or piece of coal, but in practice they remain only with this warning. Personally St. Nicholas (a long white hair, white bearded old man, who should evoke a feeling of wisdom, kindness, respect for age and consideration) visits children in nurseries, schools and at home. He carries with him big book of sins – so he knows who was good and who was bad. The kids have to say some poem or sing little song to get the treat. Regional differences remain in the composition of Nicholas' entourage. One of his assistants is the most common Devil or Devils (who supposed to represent the evil in all of us), whom St. Nicholas allegedly domesticated. The Devils are stupid and silly but underestimating them does not pay off. The other assistant is usually Angel or Snowflake, and is the epitome of beauty, tenderness and humility. Or is it? In reality, at evening a lot of adults and children gather together on main squares of their hometowns. There are many Nicholas’s, Devils and Angels walking around giving away for free sweets, fruits and potatoes (not coal as that’s expensive this days) to the children (or really to anybody who will sing or say the poem to them). The city Councils and Churches sponsor it all. Everybody is waiting for the Christmas tree lights to be turned on since 5th of the December is meant to be the official day to do so. 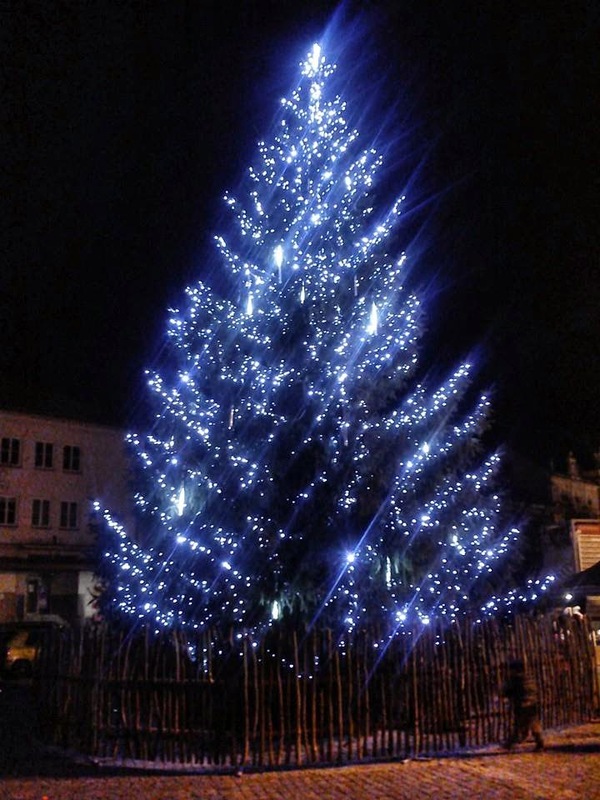 I know business is business, so in the cities and big towns the tree lights are already on, but this is little traditional region, so it is done according to real tradition. It’s lots of fun and not only for children. Even I had to put some flashing Horns on. What a pity, we don’t celebrate it in England. My husband is saying it’s just other excuse to get merry. I have to admit the Czechs are very creative in finding something or anything to celebrate at any time. I understand we’re all very busy these days trying to get the perfect gift for our loved ones. I like to shop for presents, of course, but the older I get, the more I’m trying to create them as well. It may sound silly these days, when you can buy everything, but I like the gifts to have my personal touch, a part of me in it. So I picked few crochet toys I did for Angel, and the kids in the family. It may be a little inspiration. Something still manageable to crochet before Christmas as a gift. This little purse was one of my first projects. Angel saw it on the screen and had to have it. She was not even two years old then! That’s was my girl, picking out her first purse. Even though I was a very inexperienced in crochet then, I managed it in short time. These three owls were fun to make too. I have to admit I learned a lot on those little projects. They made me more confident to try something more difficult. This bunny was the more difficult attempt. It took me rather long time to make it then, but my niece is still cuddling it. When I was stuffing it, I put jingle bells in the hands, legs and belly. Soft, cuddly and jingley, exactly how tiny babies like it. This sheep turned out to be much bigger, and much more time consuming then I originally thought, but I think it looks as good as original, if not better. Little doll was exciting to make especially the hair and dress. There are so many variations. I had little assistant to help me with the colors, and even the doll was meant to be a gift, she’s still here with us. Ladybird backpack was helpful to carry little toys to the nursery. The children are allowed to bring one small personal toy from home to nursery here, just for themselves, as security. I also made a couple of backpacks for some other kids as well. This, I think is very nice gift. I found this “ball” interesting. I crocheted it while I was waiting during Angels dancing lessons. I have to be honest; I’m carrying crocheting around with me all the time. And again, I put big jingle bell inside. Now, this Amineko cat lives in my dad’s house, since last Christmas. Last toy for today is my own Ladybird. I searched so many patterns and couldn’t find the right one. So I made my own pattern. I think it is one good looking - handsome Ladybird. I used 5og of red, 50g of black and little bit of white 100% cotton, since it’s meant to be for very little baby. (Any yarn would be just fine, as long as it suites your purposes) G/4mm hook, tapestry needle, stuffing and something for eyes. I stuffed the legs a little at this point, but it’s up to you. Don’t forget to do the stuffing now. You should be left with stuffed torso of the ladybird now. Put black eyes over white ones, arrange it on the head and saw it all on it. Add the beads or buttons of your choice in the middle. Arrange the dots as you see them on the pictures. Stuff the head and saw it onto the torso, where the biggest opening is. Saw the line on the back, and you should have the little cute Ladybug finished. I have to say I’m neglecting my other projects a little. But my step mum wrote to Father Christmas, requesting a shawl she saw somewhere. I found pattern for a very similar looking shawl on Ravelry. Since Father Christmas is very busy, I was helping him out. I think Father Christmas and I, did good job.